A coalition of 109 organizations is pushing back against Congressmen who do not want to regulate the disposal of coal combustion waste. Please call your Congressperson and ask him/her not to sign on to letters sponsored by industry that seek weak CCW ”guidelines” that skimp on environmental protections. 5) detailed analysis of floating ash particles (cenospheres) found that approximately 10% of these particles contain an iron oxide coating that may be transporting arsenic into water. 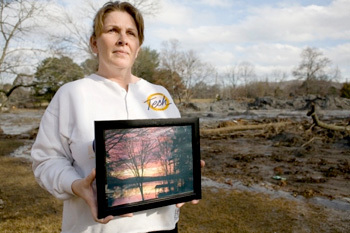 The method TVA and others are using to test and analyze the toxicity of the coal ash splayed through a neighborhood, fields and streams beside TVA's Kingston power plant can't adequately determine the potential risk, experts say. On January 8th and 9th, staff from the Tennessee Aquarium, scientists from Appalachian State University and the Watauga Riverkeeper collected water and fish samples from the Emory River. Below is a video compilation with voice-over commentary. United Mountain Defense also made a sampling trip on the Emory River on January 8, read their report. 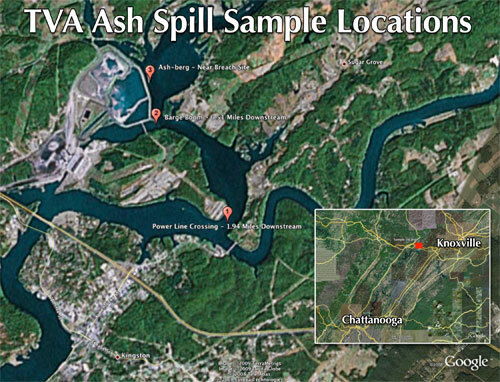 chemicals in Kingston, TN fly ash deposits and Emory River fish.